Hi, i was doing some web research after my last night’s dream with a lemur and i just ended up in your post. First of all thanks sharing your dream and it’s intepretation. So, in my dream i was in the house of some people with who i am learning gamelan angklung in Bali and i was in one bedroom packing some clothes when suddenly a lemur appears and starts to bite my leg. At the same time the window just opens with a strong wind current bringing an invasion of flies and perhaps other flying insects. I look at the floor and it was a dead baby cat (my baby cat that died recently) already half eaten by bugs and kind of rotten. Interesting that also in my dream there was a correlation between a lemur and a cat. What do you think about this? Wow! Yes, although I’m not sure what to make of it. Let’s ponder…if I have any thoughts, I’ll post them here. Thanks for sharing the dream here, anacronis! 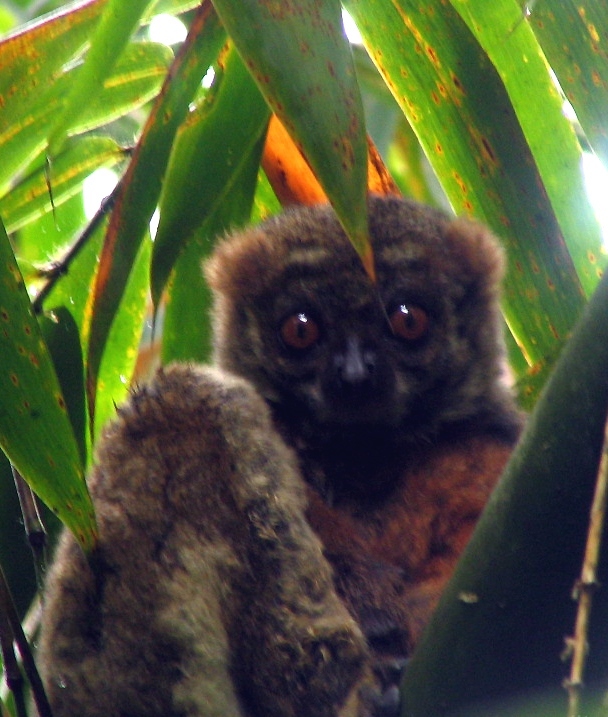 Several years ago, I had a lemur dream and still remember the vividness of the image: It is dusk, and the lemur is exploring along the edge of a cliff that is the border between two countries… a strong sense of numinosity pervaded this dream, and I, too, looked up lemurs and learned more about them. Thank you for your lemur dreams—and for sharing some of those powerful stories. 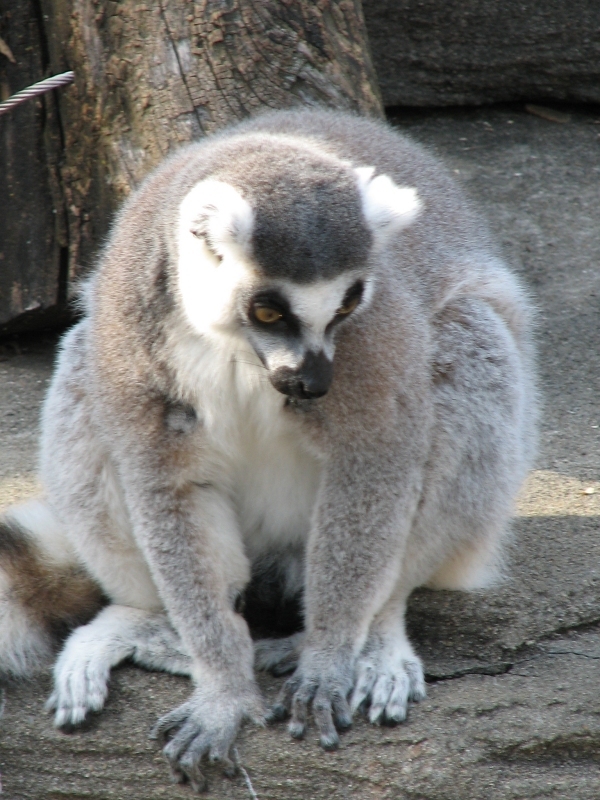 Thank you for sharing that lovely lemur dream image Kirsten. The image of a lemur as you experienced it seems very fitting for a lemur to me. The image seems loaded with hermetic qualities: cliff, borders between two countries, dusk. What a wonderful way for the lemur to appear to you. I know for me, lemurs continue to be very special creatures near and dear to my heart. Hi. Interpretation of my dream brought me here. I was in the house/bungalow I was brought up in. In the central room, which had few exits n connected to other parts/rooms of the house. I see this energetic lemur running around the room frantically looking for an exit. I am trying to grasp the situation n help it, before it starts jumping on me. Each time it takes a higher jump as if coming for me. First, I was a witness in the dream n then I call the danger (lemur) to myself. What can this signify? The interpretation of the lemurs as as vengeful ghosts of the deceased … someone who has dissed the ancestor with an improper funeral or burial is so haunting… I will definitely try to write down my dreams in order to try to catch the hidden symbolism. Dreams more than fascinate, they reveal a wholely different dimension than the dayworld. I see them not so much for what they say about the dayworld, but as glimpses into another realm, one that is entirely other and perhaps irrational when compared to the waking world. I want a cool dream like that lucid astral experience. the part where you float into the sky with planets, so totally awesome. Yes, Sindy, I want that dream again…! After reading this, I incubated a lemur dream. I’ve always found them beautiful and charming, though I’ve only seen them in pictures. My dream lemur lounged in a big wooden beach chair facing the ocean and reading a book. This beach and chair are on the April page on my 2015 calendar, sans lemur. Since I sometimes dream the future, this may be a clue to an April event. Dream symbols are so personal. My favorite book on understanding them is Mindful Dreaming by David Gordon, a psychologist who is an expert on dreams. He guides the reader through understanding his or her unique dream imagery world. He never gives you a this-means-that canned interpretation, but instead provides a way to explore your dreams as your private mythology. How cool is that? Have you ever in the past been able to incubate a dream before? Have not heard of David Gordon, but will look him up. The dream tribe idea, as I understand it, comes from Tess Castleman. I would thing hanging out at the beach would be a great lemur pastime and certainly a great human pastime as well. Yes, I have had dreams of the future too, and at one time didn’t think of dreams as having the potential to point to the future, but sometimes, it seems they do. Thanks so much for sharing your lemur dream here with me. I saw lemurs at the Cheyenne Mt Zoo just last Saturday. They are “prosimian” primates, so they are almost hauntingly human like in their intense eyes, plus your dream of how they seem like bats may refer to how they appear to be able to fly (very spry!). SO this may show an “anima/us” (was it male or female?) archetypal wish on your part to be free to ‘fly’, as your then soul travel adventure fulfills. Snce the lemur is part of YOU, you have this anima/us potential to also soar; you are not bound to the limitations of human consciousness… maybe? So cool that you got to see lemurs. They are adorable and from what I have read, very kind creatures, compared to some monkeys anyway. Yeah, not sure what to make of the dreams yet. I like Hillman’s approach of “sticking with the image,” rather than moving into Jungian concepts. I do appreciate hearing your take on the dream though. I hope you have a wonderful Holiday season! It has been fun to get to know you a bit here and through your blog posts this past year. Thank you for sharing your dreams was us Debra as they can be of service collectively. 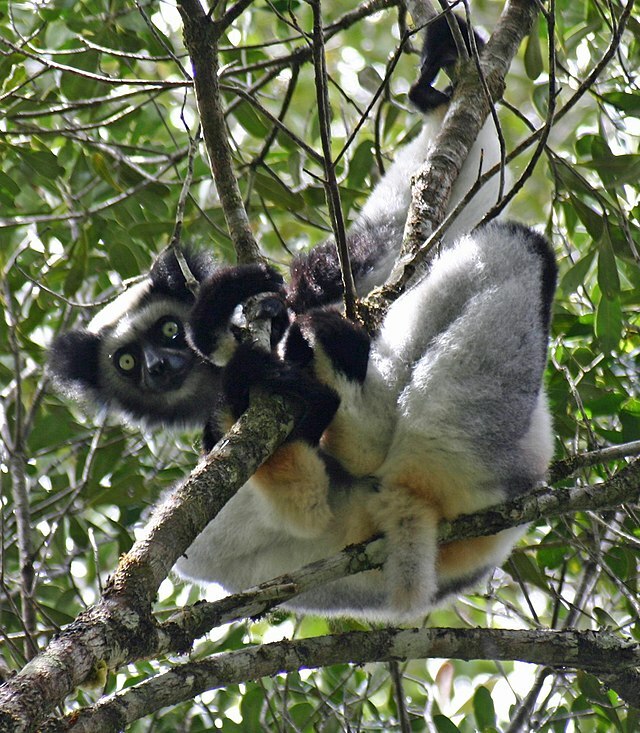 I have not seen or dreamed about Lemurs as far as I know, but I had a semi lucid dream where I ascended towards outer space and another where I was bitten by a rabbit. I blogged about that one recently. Will have to check my journal to see if any other details emerge. Yes, I do recall your rabbit dream post. I agree that there’s a message for us in dreams. Some messages are clearer than others, yes? I can’t be sure of a precise message from the lemurs yet, but I do think they reveal a rich symbolic display of a long lost connection to our animal nature and living in community. They are very communal creatures, gentle and loving compared to all the primates that have come later in history. What a wonderful Dream .. And I feel our Dreams tell us many things along with our animal totems who also share their wisdom when we look to the ‘Signs’ and take on board their meanings..
Wishing you a wonderful Christmas Debra.. Enjoy and sending you Peace and Joy..
Perhaps lemurs are a totem for me. I do now feel that they reveal to me something special that is not yet, fully comprehended. It’s not likely to happen, but I would love to travel to Madagascar! graves to attend the annual festival of the Lemuria. The mythic lost continent “Lemuria” literally meant a ghostworld. And then in your dream they were friendly with cats, who are also nocturnal. But why were they biting you? What were they trying to communicate? I believe that the main function of the dream is to point out to us something that our consciousness is missing or rejects or does not understand? That would be Jung’s take, at least. Here’s to the lifelong connection to animals. I also discovered it actually in my adulthood because my mother did not like any animals. Thank you so much for sharing your dreams, Debra. Thanks for the link. I am curious about the Lemuria festival and the lost world. It is interesting that the beautiful Lemur shares something through this common lineage of ideas. I agree, getting bitten is definitely an attention getter, getting bitten in the back implies a need to turn around and look to see the lemur. I can’t be sure of ahat they are communicating and continue to dwell on their presence for something to be revealed. I am also still pondering the rock formations on the island in the dream. They could have been crystals, judging by their shape, but, they were grey in color, almost cement or ashen. Ahh, perhaps there’s an alchemical significance there? So glad you are now able to enjoy a connection to animals! They feel vital to me. They show us something beyond what human nature can display, perhaps because animals invite such stark difference and require us to come to them on their terms? Thank you David. A lifelong connection to animals is perhaps now finding voice in me. No wonder I am such a fan of Caleb, eh?